Starting November 5, 2011, we will be featuring a new exhibition of selections from the collection in our corridor space, “Fight, Save, Buy, Wake Up! World War I Posters." Big, bold and intriguing, our World War I posters have long been favorites of mine. Throughout America’s participation in World War I—from April 1917 through November 1918—these colorful and compelling posters exhorted Americans to fight, conserve food and buy bonds. At the beginning of the war, volunteer artists formed the Division of Pictorial Publicity of the Committee on Public Information. Some of the better-known participants whose posters are featured in this exhibition are: James Montgomery Flagg (see a recent post on one of his works in the exhibition), Howard Chandler Christy, Henry Raleigh and Fred Goss Cooper (see one of his posters in the exhibition illustrating this post and another in this historic photo from Connecticut). Experienced, professional illustrators who drew pictures for books, magazines and advertisers, these artists and others turned their noted talents to selling the government’s message during the war. The Division created a host of advertisements, including 700 poster designs. Millions of their posters hung in public spaces and workplaces—citizens could not escape their pressing and persuasive messages. Posters helped recruit soldiers. They also drummed up dollars. To help finance the war, the U. S. Treasury sold savings bonds, called Liberty Loans. An army of volunteers promoted these bonds door-to-door and at rallies. Posters and other advertising for the bonds emphasized the importance of civilian participation in the fundraising effort. Four Liberty Loans and one Victory Loan, organized after the fighting concluded, helped the government raise billions of needed dollars. Along with money, Americans conserved and produced food to support the war. According to Herbert Hoover, then head of the United States Food Administration, food was “second only to military action,” in winning the war. Hoover crafted policies and organized the logistics that allowed America to feed citizens, soldiers and the Allies by controlling the supply, distribution and conservation of food. 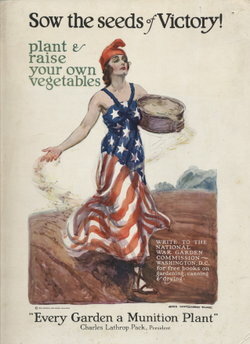 To help achieve these aims, food agencies enlisted eye-catching posters urging Americans to conserve, preserve (see one Flagg's posters encouraging canning in action), and produce. The twenty posters gathered in this exhibition offer a glimpse of a time when American citizens and artists, facing uncertain outcomes, responded to their government’s urgent requests to fight, save, buy and wake up! I hope you will have a chance to visit the museum and see if these posters might attract your attention. Sow the Seeds of Victory!, 1918. James Montgomery Flagg (1877-1860), United States. National Heritage Museum, Van Gorden-Williams Library & Archives, gift of Andrew S. Dibner, 2000/37/05. Save a Loaf a Week, 1917-1919. Fred Goss Cooper (1883-1962). Printed by W. F. Powers Co., New York, New York. Photo courtesy of the Library of Congress. Walton H. Rawls, Wake up, America! : World War I and the American Poster, New York : Abbeville Press, Inc., 1988. In 2000, the Museum purchased a World War I-era poster with the slogan “Wake Up America Day” on it. Drawn by artist James Montgomery Flagg, known for his famous illustration of Uncle Sam (see our earlier post on this image), and featuring a stylized Minuteman, this poster was a perfect addition to the Museum’s collection. Its April 19 date—the anniversary of the battle of Lexington—linked the poster more closely with the Museum’s mission. But what was Wake Up America Day? Research using online databases of historical newspapers provided some answers. Despite the war raging in Europe since August 1914, the United States had managed to remain neutral in the conflict. As German submarines sank increasing numbers of American cargo and passenger ships, it became clear to President Woodrow Wilson that war was unavoidable. On April 6, 1917, Congress declared war on Germany at Wilson’s prompting. In his April 2 address to Congress, Wilson called for at least 500,000 America men to join the fight. Recruitment events began immediately. Within days, New York’s Mayor’s Committee on National Defense had begun planning a national recruiting event, called “Wake Up America Day,” to be held less than two weeks later, on Thursday, April 19, the anniversary of the battle at Lexington and Concord. By April 10, six governors and 80 mayors in 36 states had signed on. Cities across the country planned parades, meetings and demonstrations, along with midnight church bells and horseback-riding messengers dressed as Paul Revere trotting through the streets. In Manhattan, Miss Jean Earl Moehle played the part of the well-known patriot. New York illustrator James Montgomery Flagg joined the many fellow volunteer artists who made up the Division of Pictorial Publicity of the Committee on Public Information. Created soon after America's declaration of war, this organization sought to encourage Americans’ support for the war effort through modern advertising. Posters played an important role. Flagg must have designed this poster quite quickly for it to be printed and distributed in time to advertise the April 19 event. Flagg not only designed this poster, he also oversaw the construction of “ten huge floats mounted on automobile trucks” for New York’s Wake Up America Day parade. Sixty thousand people attended New York City’s parade, and many thousand more participating across the country. Despite its national scale, Wake Up America Day failed to stimulate armed forces recruitment immediately. April 21’s New York Times commented that “whether through coincidence or not, enlistments in all branches of the service took a pronounced drop” on Friday, April 20. Although enlistments did increase the following week, volunteers did not fill the need. By May 18, 1917, the United States government instituted a draft, which remained in effect for the rest of the war. Wake Up America Day, April 19, 1917. James Montgomery Flagg (1877-1960). National Heritage Museum, Van Gorden-Williams Library and Archives, A2000/022/1. Photo by David Bohl. I Want You for U.S. Army, ca. 1917. James Montgomery Flagg (1877-1960). Courtesy of the Library of Congress. In an earlier post, we mentioned the WWI-era artwork of James Montgomery Flagg. Today, we've got a bit more to say about the image that most people associate with Flagg. While preparing for the Library & Archives upcoming exhibition on illustrated American sheet music, I came across a fairly early visual reference to James Montgomery Flagg's famous, iconic image of "Uncle Sam." The cover of "What Kind of American Are You? What Are You Doing Over Here?" 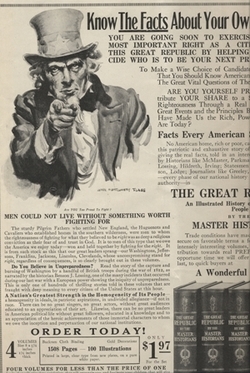 published by the Broadway Music Corporation in 1917, shows a very similar image, clearly borrowed from Flagg's, with Uncle Sam's finger pointing (or is that wagging?) at the viewer. 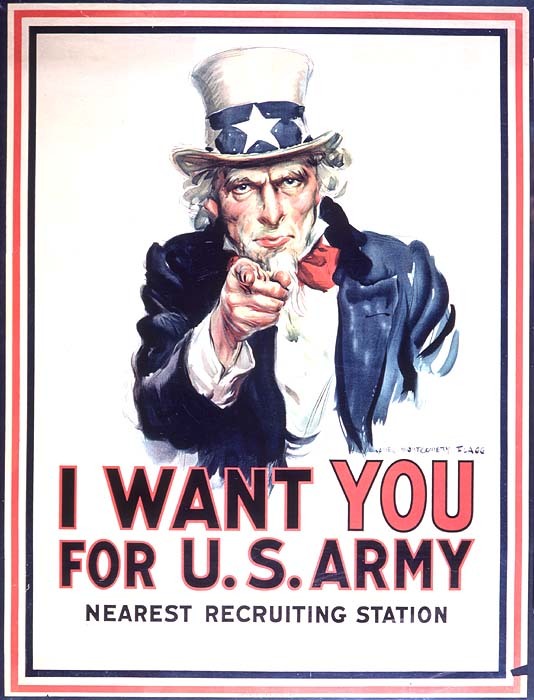 The sheet music cover was published the same year that Flagg's image of Uncle Sam first appeared on U.S. Army recruitment posters - what James Montgomery Flagg himself called "the most famous poster in the world" - the "I Want You" U.S. Army recruitment poster. As the Library of Congress notes, Flagg's illustration was first used the year before, on the cover of the July 6, 1916 issue of Leslie's Illustrated Weekly with the title "What Are you Doing for Preparedness?" - a question asked as the United States prepared to enter World War I. We have issues of Leslie's Illustrated Weekly from around this period and so I decided to see if we have this issue where Flagg's Uncle Sam image makes its first appearance. It turns out that we do. In the end, what turned out to be most interesting wasn't the image on the cover of Leslie's Weekly however, but something I found when flipping through the issue from the following week (July 13, 1916), where I found the same image of Uncle Sam - reappearing just a week after his debut. This time his image was being used to sell books in an advertisement. A detail of the ad can be seen here. The publishers of Leslie's Weekly were selling a 4-volume set called The Great Republic: An Illustrated History of the American People, by The Master Historians - all for the low price of $1.97. "Know The Facts About Your Own Country. You are soon going to exercise your most important right as a citizen of this great republic by helping to decided who is to be your next president. To make a wise choice of candidates it is important that you should know American facts bearing on the vital questions of the hour." Of course, this image of Uncle Sam has been repurposed over and over again since Flagg first created it. However, it was striking to stumble upon the second time that the image ever appeared and see that his image was being used to hawk history books - all in the name of "preparedness," and just a week after his debut. What is a Liberty Cap? The woman planting seeds in the garden symbolizes America. She is draped in an American flag and wearing a stocking cap called a Liberty cap. This cap symbolized freedom and was used during the American Revolution and French Revolution. Here, the illustrator makes reference to this symbolism for those seeking freedom during World War I. The poster was produced by the National War Garden Commission in Washington, D.C. They encouraged Americans to garden, can, and dry foods during WWI. It is on cardstock, small in size, and meant to be placed in windows.